From Dhirubhai Ambani to Anil Agarwal, India has its storied entrepreneurs who began as small-time traders before transforming into builders of diversified manufacturing conglomerates. Alongside—albeit not on a similar scale—a clutch of Indian fast-moving consumer brands has been built by founders who began as traders. Marico is the name that perhaps comes first to mind, although brands like Parachute and Saffola that Harsh Mariwala built were a part of Bombay Oil Industries, out of which Marico was carved in 1990. One trader, in electrical goods, who succeeded in building a top-notch fast-moving brand is Qimat Rai Gupta, after acquiring the Havells switchgear label in the early 70s. Since then, Gupta and the generation after him have built Havells into one of India’s largest electrical equipment marketers. Havells is a story that’s been told often over the years. 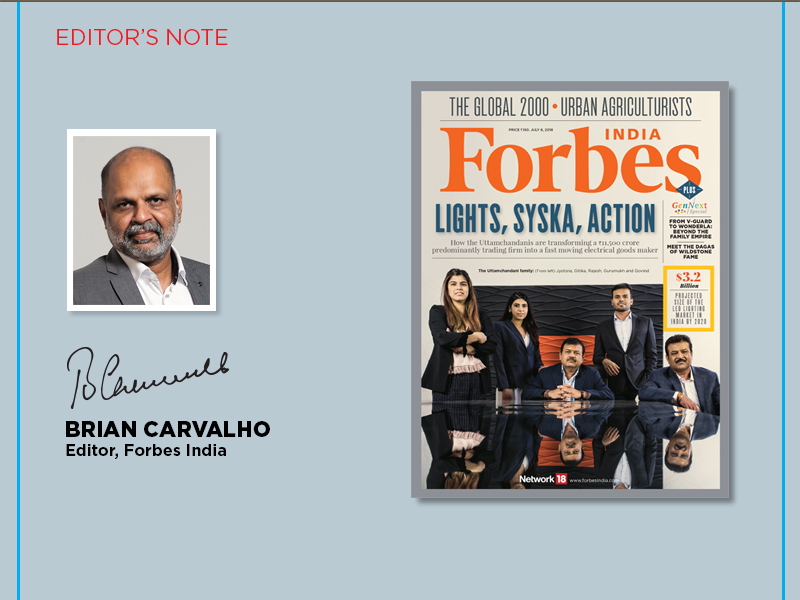 Forbes India’s endeavour is to look out for journeys less chronicled. 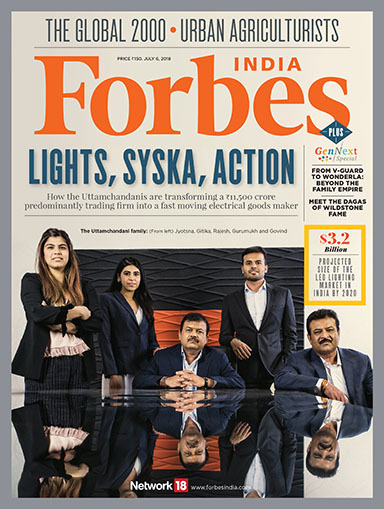 Like this fortnight’s cover story on the Syska group by Rajiv Singh. The Uttamchandanis of Syska today earn the bulk of their revenue from distributing Samsung mobiles and accessories. That’s set to change over the years as Syska seeks to become a brand to reckon with in LED lighting and, more recently, in wires and cables. Personal care products like trimmers, shavers and hair straighteners have also been launched. The goal: To transform into a fast-moving electrical goods (FMEG) giant and grow revenues roughly four-and-a-fold in four years: To ₹50,000 crore by 2022. Ambitious? Perhaps. But it’s been a promising beginning in FMEG for the Uttamchandanis, first-generation entrepreneurs who set out by distributing TVs and VCRs for music company T-Series in the 80s. At Syska, gen-next family members Jyotsna, Gitika and Gurumukh are in the thick of things. And it’s no different at a number of family-run groups as we discovered in our Gen-Next Special, what with scions doing their bit to change the way business is run to keep up with the times. In a few cases, the next-gen members prefer to do their own thing rather than follow in the footsteps of the founders. Example: Arun Chittilappilly, who consciously chose not to join his father’s V-Guard Industries. Instead, he chose amusement parks; the 39-year-old is MD of the Wonderla chain of amusement parks. Read Anshul Dhamija’s piece on Wonderla to figure how unique the business model is from theme parks like Disneyland in the West. Elsewhere, it’s a nephew-uncle combination that’s charting out a new course. Kaveri Seeds, which has had a good run with hybrid cotton, is now attempting an encore in hybrids with maize, rice and vegetables. One reason for diversifying: Price regulation in Bt cotton, which has hit profitability. Samar Srivastava delves deep into the company founded by scientist GV Bhaskar Rao and attempts to gauge its prospects. Staying with agriculture, there’s a new crop of urban farmers emerging. If that sounds counterintuitive at a time when agriculture is under stress, well this new breed is trying to achieve exactly what the Indian farm sector needs: Higher yields with the help of new techniques of farming and marketing. Jasodhara Banerjee met a group of these urban agriculturists who have quit cushy corporate jobs to bridge the gap between rural farms and urban consumers. The distance between Bharat and the metros is surely getting shorter.